Our Family review on Boomtown 2018 from the Oldies point of view! 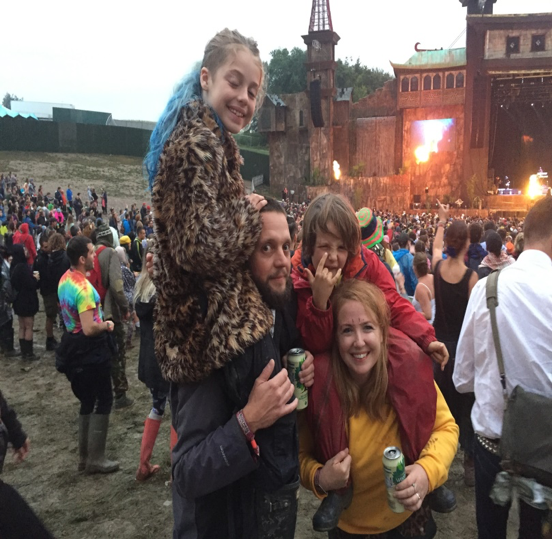 We’ve just got back from taking our family to the most amazing weekend at Boomtown. We were totally blown away by this festival. It had all the weird and wonderfulness of all the best festivals we’ve ever been to crammed in to one ‘Boomtown’. If you’re in two minds about bringing your kids to Boomtown after maybe hearing mixed reviews about it not having the best reputation as a family festival, hopefully this blog will change your mind. A lot of the negatives we heard about bringing our little humans to boomtown came from people without children. People who haven’t experienced Boomtown with kids themselves or people who have probably never made it past Hilltop who spend most of their days asleep and nights partying in the Downtown district. But Boomtown has a whole different side to staying up and raving all night. If we had the chance we would be doing exactly that, but because we had our kids in tow we got to see a much more gentle side of the festival. If you’re an up for it family who likes all the random craziness of festivals this could be the perfect family festival for you. We took both of our kids; our little boy Ruhi who is 7 and daughter Lyla who is 9. They have always been to festivals ever since they were babies, however this was the first year without our festival buggy and they had to use their little legs to get from A to B. Boomtown has far too much going on to have to head exhausted back to camp early, but we found it to be a manageable size and even managed to randomly bump into friends. Admittedly, the hill between Hilltop and Downtown is sometimes pretty tiring for the kids but nothing a rest half way up doesn’t fix and we can’t complain too much about the hilliness of the site because it provided us with the most beautiful views over the festival. 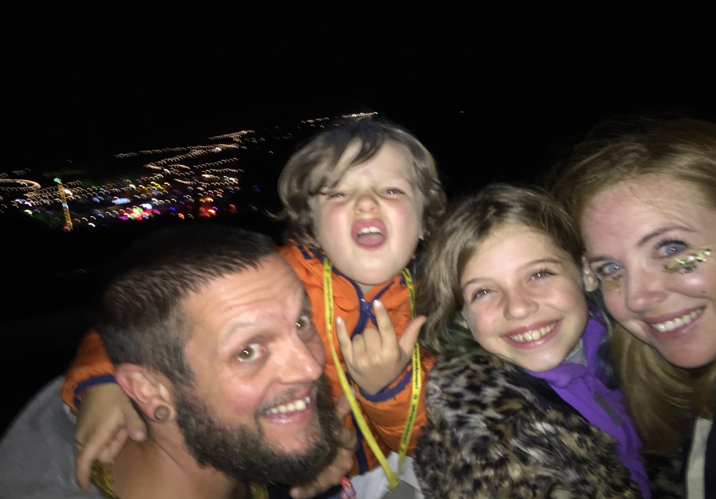 One of our best memories of Boomtown is the whole family sitting on top of our transit van late at night overlooking the festival and watching all the lights flashing, listening to distant music with everyone having the time of their lives. The festival is separated into different districts. Downtown was great even though it’s not really aimed at kids. It’s still an amazing part of the festival to head to during the day as it has lots of rides for the children to go on and wild and wacky things to experience. In the evenings we tended to wander on up to Hilltop where we spent time in the different districts there where there was loads of amazing stuff going on until the early hours. Old Town was great, lots of weird and wonderfulness going on in twisted fairground, with surprises behind every door you go through. We also loved Copper County and spent a Sunday afternoon listening to the bands on the Old Mines stage. Whistlers Green is another one of our faves. It’s a lovely area to hang out either day or night but we especially loved it here on an evening sitting around the massive fire with other festival goers chatting, laughing and drinking. They have a little band stand, an open mic, little disco and a fire show each night which the kids loved to watch. It’s such a chilled vibe up in Whistlers Green we spent most the evenings chilling here after a hectic day before heading off to bed. Lion’s Den is one of the main music stages and a great place to hang out day or night with kids and it isn’t too far if you’re camping up at Whistlers Green. The opening Ceremony for the festival is held there. The stage is awesome and you have a great view from wherever you are. Tribe of Frog has DJs on pretty much all day but if your little ones are still up for it it’s a great place to take them at night to see all the trees lit up with UV lights. Kidztown was awesome. It has everything you ever need to keep them busy for the whole day. It’s not as big as Glastonbury’s kids field but it’s just as good and the creativeness that has gone in to building this beautiful little town for our children to enjoy is insane. I mean where else can your children open a bank account with a giant pig at a festival or join in with a mad hatters tea party. All the staff in the field were lovely and had so much time for the kids, helping them to master their circus skills or build a huge time machine with nails, drills, hammers all the things you cringe about a 7 year old being let loose with at home. We camped in the Whistlers Green area. It’s the perfect place to camp if you’re going with your family because it’s only a few minutes away from Kidztown, so if you need to keep going back and forth to camp you’re right there. It’s also nice and quiet on the evening compared to other parts of the festival and you’re not kept up by the loud music from the Downtown district. The staff were great at making sure that it was families only heading for family camping. There were lots compost toilets around, which always had enough loo roll in and plenty of sanitizer outside and also Lots of recycling bins dotted around separating plastic, cans and general waste. There are tons of yummy food stalls everywhere you go and also most importantly lots of bars. I would recommend taking plenty of soft drinks for your kids as these are pretty pricey at £2.50 for a small bottle. Even though we were expecting the majority of people at Boomtown to be a lot younger than us (us being 35 and 38) we didn’t find this the case. The vibe over the whole festival was amazing and we didn’t see anything apart from people having the time of their lives. It had all the best parts of Glastonbury, Camp Bestival, Shambala rolled up in to one. It’s crazy in the best possible way. It’s full of fun. It’s unique, friendly and totally insane. We are so glad that we decided to pack up and bring the kids along with us. We all had the most incredible weekend exploring everything it has to offer. It’s now a firm favourite in our house and we are already looking forward to Chapter 11. Thanks Boomtown See you next year! This was our first time at Boomtown Festival. We’ve been to festivals before but never Boomtown, we were super excited for a fresh new sparkly festival and couldn’t wait to get there. I went with my Mum, Dad and Little Brother Ruhi, we arrived on the Thursday and parked the caravan up at Whistlers Green (Hilltop) we had a phenomenal view over all of sunny Boomtown. Annoyingly, as we left the caravan it started to rain but that didn’t dampen our mood we put some glitter on and started to explore the festival. Kidztown was really fun it had lots of cool tents and workshops to go in like a Tattoo Tent, a Circus Tent, a Science Tent and a Wood Crafts tent. They are all equally fun but the best part of Kidztown was the Piggy Bank and the Post Office. It was so crazy because inside the Post Office the staff gave you a challenge to do one of the three things; write a letter, do the weather challenge or make a stamp. Once you’ve completed these tasks they give you instructions to go over to the Piggy Bank which was across the road and open a Boomtown bank account. Once you’ve opened your account with a huge silly pig sat behind the counter you had to go and do all the fun stuff in each of the tents to complete the piggy bank course and then you can get to choose a random prize from the giant silly pig. I learnt how to ride a unicycle. I learnt how to make slime. We learnt how to make sherbet and ice-cream. We did Forest School and learnt how to make leaf prints on fabric. We learnt how to colour in the cracked bits of a flint. We learnt how to hammer a pattern on to wood with nails which we then tied wool around to make a cool pattern. All the staff in the kids field were so nice and always helping us to make things and be super creative. Hilltop is really cool because there are lots of buildings put up like in the olden days with funny names like ‘Grannies Living Room’ which had a big rave going on inside and lots of people dressed as grannies and Grandads hanging around outside. There was also a pub called Nobody’s inn. There were lots of little random parts to Hilltop that you can go in, every door has something amazing going on behind it, there was this place called Twisted that put on a circus show – a weird dark circus show – like the very opposite to The Greatest Showman. Sadly the generator broke down but funnily enough the people from the show started doing handstands and backflips on the wet ground to entertain us and that was really funny. Hilltop also has lots more crazy things, like all the people dressed up in fancy dress clothes. It’s a bit like a fairground! We saw a scary clown with a puppet that looked exactly like him just smaller and there was another man with his face painted as white as paper and a lime green beard who was dressed like a pirate and he held a large gold megaphone. Some children might find Hilltop a little bit scary especially if you don’t like clowns but actually all the people dressed up were happy to see us. They got us involved in whatever they were doing, it was fun! Hilltop also has a few more rides, we went on the Helter-skelter. Downtown was down a really big hill – or you can use the steep steps, I preferred the hill because it wasn’t as steep. Downtown was so cool we went on lots of fairground rides which you have to pay for but they were really fast and really good! I liked the music at the festival. We danced in the woods at night when it was all lit up and I got to meet one of my favourite singers and have a photo taken with him. Me and my brother both loved all the art around the festival, all the compost toilets had different graffiti on them and they were really funny. Another really cool secret place to go in Boomtown is a dancing water fountain that lights up all different colours in the middle of the woods, It’s so cool to watch at night in the dark. I really loved Boomtown and can’t wait to go again! Huge love to the Nashes! Remember you can find everything you need to know about bringing your family to Boomtown on the Boomtown Families pages here.